In a small bowl, mix together the flour, cayenne pepper, some salt and pepper, the egg and soda water. 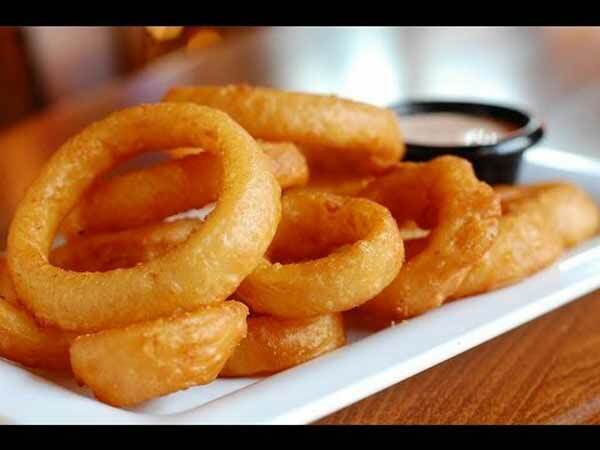 Before dipping the onion rings, add some ice cubes to keep the mixture very cold. Dip the separated onion slices into the batter until they are all coated and set aside. Deep fry the rings, a few at a time, until golden brown, 2 to 3 minutes. Remove to paper towels to drain. Season with salt and pepper and serve. Cook’s Note: Ice makes the batter cold and that makes it better for frying, according to Warmrecipe.com.